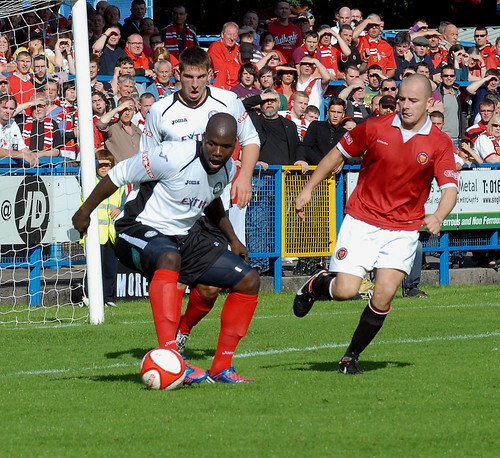 Hednesford Town made it five games unbeaten thanks to Michael Lennon’s 81st minute equaliser, his first goal for his new club, which cancelled out Carlos Roca’s first half effort for FC United, writes Scott Smith. The Pitmen made just one change to their team with Alex Melbourne coming into the side for John Disney, who dropped down to the bench. He was joined their by new signing Mark Hingley who has recently joined the club from West Bromwich Albion. 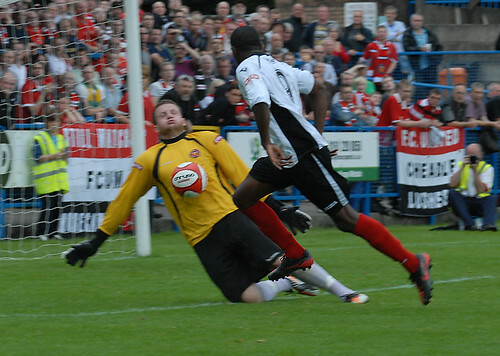 The opening exchanges were fairly even, although FC United did have a couple of early chances with Hednesford goalkeeper Dan Crane having to turn a header behind for corner before smothering a Matthew Wolfenden shot after the winger broke clear. Town came more into it as the game wore on and after 27 minutes Aaron Rey forced United goalkeeper James Spencer into an excellent save to turn the ball behind for a corner. 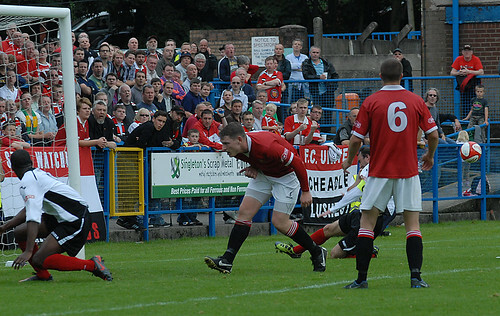 Hednesford would fall behind just four minutes later though as Roca picked the ball up on the right-hand side and drove towards the box before hitting a cross come shot which deceived everyone and struck the post on its way into the net. To be fair Town responded well and almost drew level straight away when Nathan Woolfe’s cross from the left was somehow missed by three Pitman players inside the six-yard box. While nine minutes before the break both Ben Bailey and Neil Harvey saw goalbound efforts blocked in the space of a few seconds as Hednesford pressed hard for an equaliser. 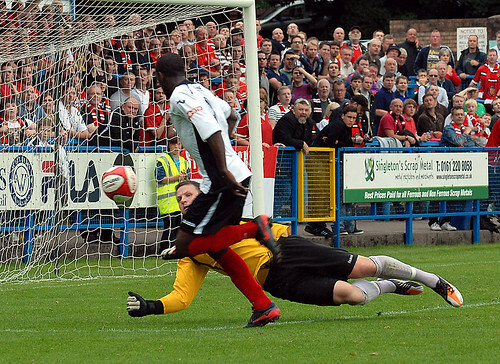 The Pitmen were almost caught out at the start of the second half as Jerome Wright took the ball past Melbourne before seeing his shot blocked by Francino Francis inside the penalty area in the 50th minute. 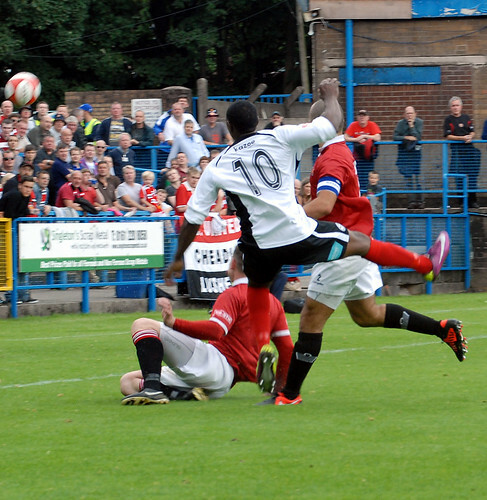 For the next 20 minutes though Hednesford put their hosts on the back foot. First Harvey headed wide from a Melbourne cross before Rey’s stinging shot was palmed away by Spencer. This was followed by Woolfe striking the upright from a 25-yard freekick which had been awarded after Harvey had been bundled over on the hour mark. With Rob Smith sending on further attackers Sean O’Connor and Lennon, in order to try and take something from the game, The Pitmen finally found an equaliser in the 81st minute. After a corner had been cleared the ball fell to Darren Campion who lifted it back into Lennon who with his first touch brought the ball under control before delightfully shooting across Spencer and into the net. The game was now very much end-to-end as both teams went in search of a second goal and Hednesford were indebted to goalkeeper Crane for earning a point as he superbly tipped Wright’s late freekick over the bar to preserve a point for The Pitmen. 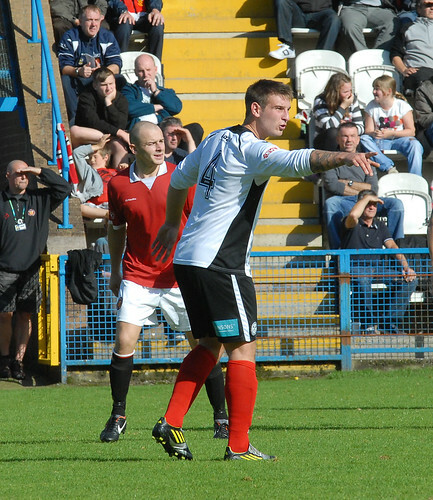 Hednesford will look to make it six games unbeaten when they take on Eastwood Town at Keys Park on Tuesday 4th September, 7.45pm kick-off.